20 minute sub frames with Hydrogen Alpha is certainly the way forward! To say I am happy is a massive understatement!!! The bubble nebula is one of a small number of bubble shaped nebula in the sky. A almost perfect bubble of expanding gas around an energetic star. A similar target is the Thor's Helment Nebula in the late winter skies. Earlier in my Astrophotography career I was very excited to detect any residual of the bubble showing on my modified webcam. As I progress I finally could get the whole bubble ring to go "all the way around". 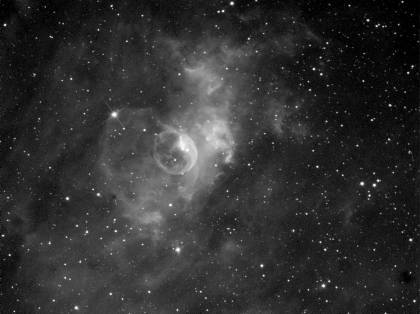 The Bubble nebula is now a challage for astrophotography for different reasons. Now it is a challange to keep the bright bubble part of the picture under control, whilst capturing the rich background of glowing hydrogen Alpha gases. I am tempted to try and get some OIII data on this target, but I have heard a lot of stories from poeple that this region is predominately Ha, and with very little OIII, so maybe I will give tri-colour narrowband a miss on this target for now.